Parents are being urged to vaccinate their children against flu in time for Christmas, partly to avoid putting older relatives at risk. Health officials say that without the flu vaccination children are more likely to contract the virus at nursery or school and spread it at a rapid rate. The NHS warns this could pose a particular risk to older people and other vulnerable groups who come into contact with children at family get-togethers over the festive season. Older people, people with asthma, pregnant women and people with heart, liver or lung complaints, are particularly vulnerable to flu, which causes 8,000 deaths in England a year. Doctors are appealing for parents to take up the free flu vaccination for children to curb infection over the Christmas holidays. NHS England medical director for acute care Keith Willett said: 'Flu can be spread more easily by children, especially to vulnerable relatives such as older grandparents, those with heart or lung conditions and pregnant family members. 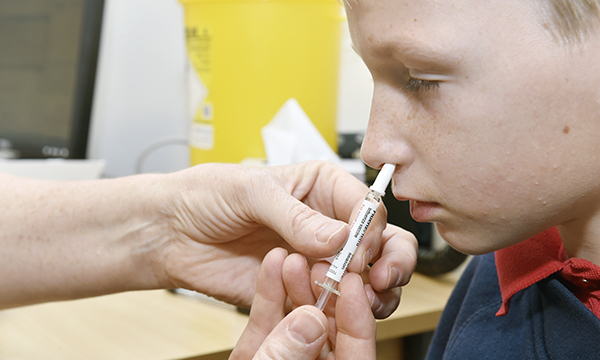 Free flu vaccinations have been expanded to cover children in school year 4, but just 18% of school-age children have had the nasal spray immunisation, according to the latest figures. NHS England and Public Health England (PHE) are also urging hundreds of thousands of front-line social care workers to get vaccinated, with the NHS providing £10 million to help curb the spread of flu to older people in their care. PHE medical director Paul Cosford said the vaccine is the best protection against the flu. 'The nasal spray vaccine last year reduced children's risk of flu by 65% meaning they were less likely to spread it to relatives and others they come into close contact with. 'Over the next few weeks ahead of Christmas, we urge parents of eligible children aged two and three to book their vaccine via their GP or local pharmacy.